Zazen is at the heart of Zen Buddhist practice. The aim of Zazen is to still the rational mind. This is done either through koans, Rinzai’s primary method, or simple meditation, the Soto sect’s method. Once the mind is able to rid itself of its many layers, it will then be able to realize its true Buddha nature. In Zen Buddhism, zazen (Japanese: literally «seated meditation») is a meditative discipline practitioners perform to calm the body and the mind and experience insight into the nature of existence. Long periods of zazen, usually performed in groups at a zendo (meditation hall), may alternate with periods of kinhin (walking meditation). The beginning of a zazen period is traditionally announced by ringing a bell three times (shijosho), and the end of a round by ringing the bell once (hozensho). Before and after sitting on the zafu, zen practitioners perform a gassho bow to the cushion, to fellow practitioners, and to the teacher. In addition, it is not uncommon for modern practitioners to sit zazen in a chair, often with a wedge behind the lower back to help maintain the natural curve of the spine. 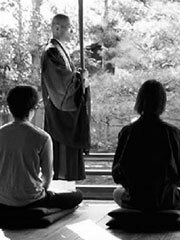 To many in the West, zazen is an almost completely unfamiliar practice, which leaves an opportunity for many misconceptions to spring up. One common misconception is that zazen meditation entails the shutting out of all worldly stimuli in order to reach some special, superior state of mind. For example, in the film Crouching Tiger, Hidden Dragon, the character Li Mu Bai (李慕白) (played by Chow Yun Fat) describes reaching a frame of mind during meditation which is «pure light». While the zazen experience is inherently different for each practitioner, and such phenomena are not at all out of the question, such states of mind are not the goal of zazen. However, to many who practice zazen there is a direct correlation between the cultivation of a focused state of mind and a relaxed body (Johanus Itten, Elements of Color) which is often achieved in martial art activities as well as Chinese, Japanese, and even Western practices of painting and calligraphy, for these are Fine Arts. In these arts the medium is unifying and technique must be «correct» therefore one has to begin with this «zanshin» state of being before executing the work of art, so that the work is executed with an almost certain action. This process takes «endless practice, and many mistakes that have to constantly be corrected in detail.» Meditation to the zen practitioner does not take on a dogmatic theological pantheon of worship, but instead is considered the foundation of a rational and natural inquiry into the reality of nature. Enlightenment is theorized as a focused state of mind and a relaxed body that allows one to approximate certainty about the reality of nature. The arts in these cultures were often used as a way for perfecting this discipline, but were not meant to inflate the ego as a desire for greatness in the particular field that such practices occurred. Instead, it seems that they would use the practices to further their ability to meditate and reach a certain truth about nature. It is important to note that Zazen holds meditation as foundational and self evident and this has an interesting correlation to Western philosophy’s a priori Rationalism, which stemmed from René Descartes’ Meditations on First Philosophy. It is a particularly interesting position in human culture, but it does not necessarily resolve the problem of mind and solipsism in philosophy, however the practice is a cogent one and not to be misunderstood. Like western philosophy, it is a critical discipline. John Daishin Buksbazen, Peter Matthiessen (Foreword). (2002) Zen Meditation in Plain English. Wisdom Publications. ISBN 0-86-171316-8.